Deep-frying food is one of the easiest ways to cook, but it is also considered dangerous and a hassle to clean up. When you boil oil in a pot for deep-frying it can be a hazard because oil splatters can cause serious injuries. Even if you do come out of the frying unscathed while using a pot or a shallow frying pan, you are now faced with cleaning up all the oil splatters created while you were cooking. This makes home cooks avoid deep-frying, even if it is one of the easiest and most delicious ways to prepare a meal. For those reasons alone many home cooks turn to deep fryers to lessen the hassle of cooking perfectly crisp and delectable fried goodness. Having a deep fryer at home can give you the experience of deep-frying without the worry of splatters that occur during and after cooking. This is why the T-fal Oil Filtration Ultimate EZ Clean Immersion Deep Fryer is considered a popular kitchen helper. You can now recreate famous fair food like deep fried Oreos and Twinkies at home with the help of the T-fal Oil Filtration Ultimate EZ Clean Immersion Deep Fryer. Learn more about this unit’s features, advantages, and disadvantages to see if it will make a good addition to your kitchen. The problem with deep-frying is the consistency of the temperature of the oil. This is what produces fried food that comes out consistently perfectly golden and crisp. The T-fal Oil Filtration Ultimate EZ Clean Immersion Deep Fryer addresses this issue with its immersion type heating element. This feature helps the deep fryer maintain the correct cooking temperature to create the best fried food results. Some who have used this deep fryer have even made fried food that tastes better than what you sometimes receive at restaurants. Another advantage of the T-fal Oil Filtration Ultimate EZ Clean Immersion Deep Fryer is its oil tank. Once the oil has cooled down, you can simply strain the oil by flipping the lever on the front. This will allow the oil to strain through a fine mesh stainless steel screen at the bottom of the steel tank. The oil will then be stored in a plastic tank with a pour spout to make it easy to transfer back to its original container. This makes cleaning up the excess oil and reusing it for another deep-frying session simple and manageable. Finally, the T-fal Oil Filtration Ultimate EZ Clean Immersion Deep Fryer is very easy to clean because most of its parts are dishwasher safe. You can take it apart after use and let your dishwasher do all the cleaning for you. This deep fryer is very easy to use and allows you reuse the oil to give you bigger savings. Deep-frying food is made better, safer, and simpler with the help of this deep fryer and it will surely give your kitchen and your cooking an extra edge. You’ll never have to go out to buy French fries again. 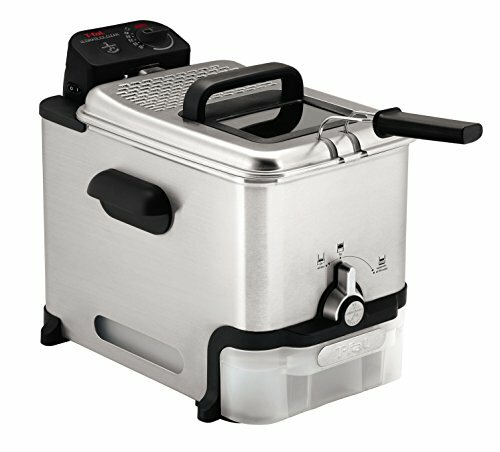 Just like most deep fryers the T-fal Oil Filtration Ultimate EZ Clean Immersion Deep Fryer also has a very short cord that is held in place with a magnet. Although it may seem like a hassle to have such a short cord that can easily come off, this is actually a safety feature to keep you from tipping or spilling the contents when it is accidentally pulled or snagged. The T-fal Oil Filtration Ultimate EZ Clean Immersion Deep Fryer is also a bit expensive for a deep fryer, especially for those who plan on using the unit on rare occasions. This is because of the patented EZ Clean, Oil Filtration, and Immersion Heating Element features. The combination of these features make this deep fryer one of a kind and reasonably priced. If anyone has received a unit that arrived with broken parts should contact T-fal immediately. They will ask for some details and possibly photos of your concern, and they will address it as quickly as possible. This may be due to shipping mishandling or a manufacturing error. If there are any issues you should contact their customer service as soon as possible to resolve the issue. If you want a high-quality product that produces the perfect fried food every time you use it, this is the unit you should go for. The T-fal Oil Filtration Ultimate EZ Clean Immersion Deep Fryer will make you enjoy deep-frying and appreciate the deliciousness of a perfectly fried food.